Once a year Old Cahawba opens its gates to the public and every year several ghost hunters and history lovers who are brave enough make the journey to Alabama’s first capital city walk through those gates. Hunters, history buffs and those just interested in an interesting night climbed aboard a converted cotton trailer Friday. The roomy open-air cabin moved in the quiet, starry night. The headlights cut through the darkness, which enveloped the passengers behind. The first stop on the tour was the New Cemetery, which was created in 1851. Luminaries lit the path to the tour’s first stop. Derry pointed out a monument to the Bells. One side reads J.R. Bell and the other remembers J.A. Bell. They were father and son who were killed in a shoot-out in the main street of Cahawba. The Bells' deaths were the ultimate conclusion of a long feud, which accused the family of making their slave steal keys from people, or was it? Derry first experienced a ghostly encounter at Cahawba about 20 years ago right at the base of the Bells' monument. A group of ghost hunters came in to investigate the historic and haunted town. Derry was out in the graveyard with them when the hunters became very excited. They called her over to the Bell’s monument and said they had a very clear EVP (Electronic Voice Phenomena), which is a recording that plays an unexplained voice. Derry went on her day and then went home, but she still wondered what Don key could mean. That following morning she found out. Don came in that day and told Derry he couldn’t find his keys. She relayed to him about the “Don key” episode so they decided to look at the Bell’s monument. However, the keys were not there. 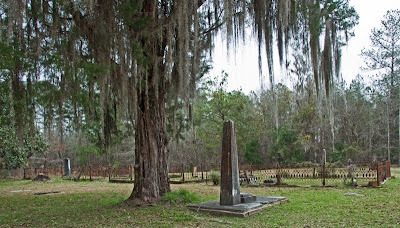 Later that day they were found — in the slave cemetery by the Bells' slave who was accused of taking keys for the family. With that story in mind the hunters were sent off with two members of Central Alabama Paranormal Investigators. The group spread out trying to find any abnormal activity before heading to the Barker's Slave Quarters. There they learned about the Kirkpatrick family who renovated and then inhabited the home for mere weeks. The hunters were able to explore the first floor and the back of the home. One man who lived in the area for a short time as a kid, Clifton Kirkpatrick, experienced a ghostly encounter almost daily then. However he didn’t know it. When Clifton was a young kid he would go out near the cemetery and river. He was told to mind his step by a man named Gat. Everyday he would go out and play like young boys would do — getting into things he wasn’t supposed to do or going a little too far — all the time his trusty older friend Gat would tell him to be careful. Clifton was relaying his memories of his old friend one day many years after the fact when he was told that his caretaker Gat had died several years before he was even born. Stories like this swirl around Old Cahawba and once a year people can come through the gates. Some come to experience the ghosts like Hannah Estes, Prattville. Some visitors came because of their love of Cahawba and the history surrounding it. From the mystical shadows of long ago comes the memory of one of those strange, mysterious, uncanny phenomena connected with this place that sometimes happens to astonish the most materialistic, and which at the time of its occurrence caused much interest and speculation even among the most intelligent and best-informed citizens of Cahaba. In the spring of 1862, on one of those brilliant moonlight nights, a night "in which nature seems in silent contemplation to adore its Maker," a young lady and gentleman, prom, promenading near the maze of cedars, turned to enter one of the circular walks leading to the center of the labyrinth, when they were startled to see a large white, luminous ball moving a few feet above the ground in front of them, apparently floating in air. This ball would dart first on one side of the walk and then on the other, approach close enough to almost touch them, recede and disappear in the shrubbery, to suddenly be seen again floating beside them. Thinking the apparition was a trick of fancy or was caused by same peculiar phase of the moon's shadows, they turned to retrace their steps, when again it appeared in front of them, going through the same gyrations. The gentlemen now determined to test the materiality of the object; but just as he attempted to grasp it, it darted beyond his reach and disappeared, to be seen no more that night. On several occasions this apparition appeared to other parties, and became known as the "Pegues Ghost." No one could ever definitely explain what it was, but general opinion finally concluded it to be one of those strange phosphorescent phenomena so often read of but rarely seen, known as "will-o'-the-wisp" or Jack-o'-lantern." 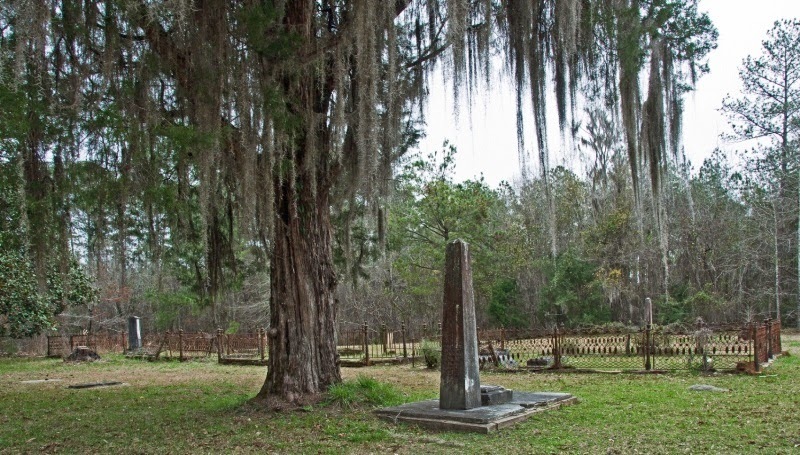 One famous event during Cahawba's Civil War-era was the arrival of the town's first apparition, the will-o'-the-wisp wisp known as the "Pegues' Ghost." In 1862, on a moonlit night, a young couple was walking behind Colonel C. C. Pegues' home, ambling about the thick stand of cedars when a glowing ball of white light suddenly appeared before them. Flashing from side to side a few feet above the path, the apparition moved so close that they could almost touch it, then quickly disappeared in the undergrowth only to reappear beside them moments later. When the gentleman tried to touch the object, it disappeared -- much like the town itself was soon fated to vanish. One cannot help but wonder about the historical circumstances and coincidences that surround the Pegues' Ghost story. The home of Colonel Pegues, the leader of the Cahaba Rifles, Fifth Alabama Regiment, was the social center of the town during this time. The large grounds with their forest of cedars, magnolia trees, Lombardy pines, scented Cowers and fountains describe the ideal retreat for lovers desperate in escape the harsh realities of war. The home was a place to court and to forget. But significantly, it was Colonel Pegues that would return home to recruit more men for his Cahaba Rifles. Was the young man in the story a recruit? 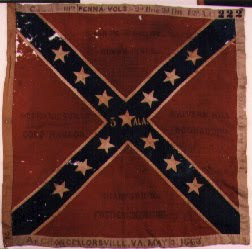 That the apparition first showed up in 1862 seems undeniably significant, for at the Battle of Gains Mills in Virginia on June 27 that very same year, Colonel Pegues was fatally wounded. He died two weeks later. Was the apparition a warning to young recruits? To Pegues himself?